In viewing and interacting with robots in social settings, users attribute character traits to the system. This attribution often occurs by coincidence as a result of past experiences, and not by intentional design. 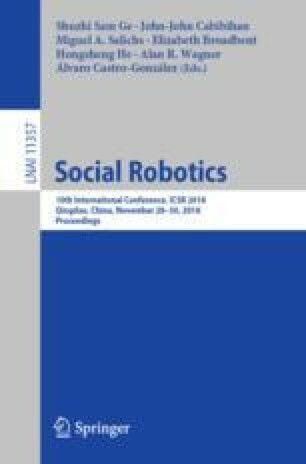 This paper presents a flexible, expressive prototype that augments an existing mobile robot platform in order to create intentional attribution through a previously developed design methodology, resulting in an altered perception of the non-anthropomorphic robotic system. The prototype allows customization through five modalities: customizable eyes, a simulated breath motion, movement, color, and form. Initial results with human subject audience members show that, while participants found the robot likable, they did not consider it anthropomorphic. Moreover, individual viewers saw shifts in perception according to performer interactions. Future work will leverage this prototype to modulate the reactions viewers might have to a mobile robot in a variety of environments. This work was conducted under IRB #17427 and supported by a National Science Foundation (NSF) grant #1528036. The Conference on Research for Choreographic Interfaces (CRCI) provided support for Time to Compile, created by Catie Cuan in collaboration with the RAD Lab.